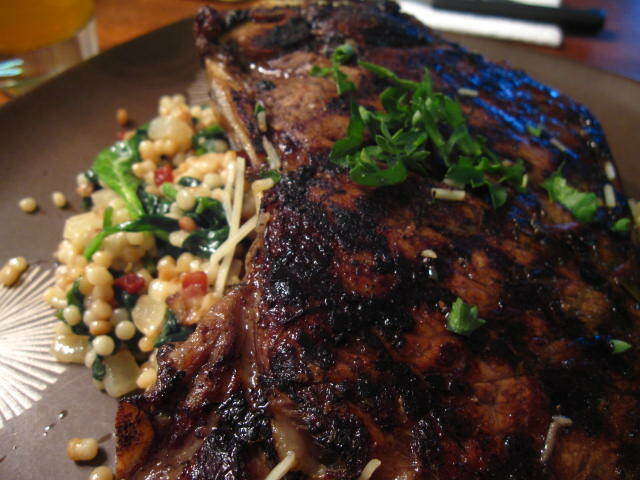 Grilled balsamic-marinated strip steak over a bed of creamy bacon and spinach couscous. Marinate the steak in olive oil, balsamic vinegar, garlic, onions, parsley, salt and pepper. Then grill and finish in the oven at 400 degrees. For the couscous,toast in pan and add chicken stock. Cover and simmer until all liquid is absorbed. Set aside. Render down diced bacon and sweat some white onion in the bacon fat. Saute the garlic and spinach and add the already cooked couscous. Finish with heavy cream and Parmesan cheese.